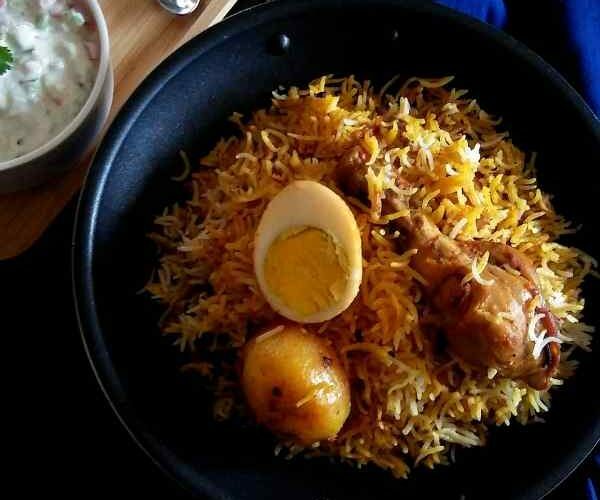 Calcutta Style Chicken Biryani/Calcutta Chicken Biryani is the epitome of deliciousness for biryani lovers. This is one of my most favorite recipes. I am a big fan of Biryani in almost any form. I remember whenever I had been to Calcutta. I was looking for places to get a good Biryani. 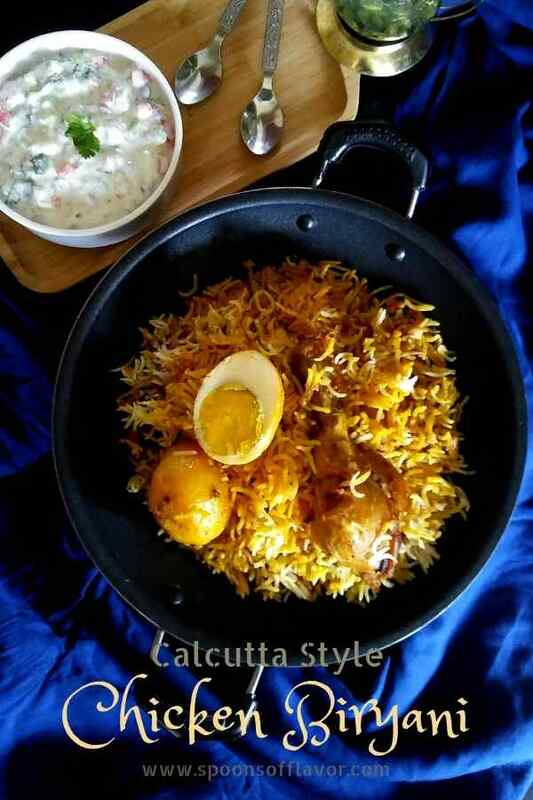 Calcutta Biryani is believed to be adopted from Awadhi biryani. The indigenous flavor and mouth-watering taste of Calcutta biryanis are just incredible. The homemade biryani masala plays a great role for that. Though the total process of making Calcutta style chicken biryani looks a bit lengthy. But it becomes easy once the ingredients are arranged beforehand. I would suggest preparing the biriyani masala, barista, and chicken marination at least a few hours before. Hence the rest of the things can be done simultaneously. It goes very well with chicken chaap or some raita or any chicken gravy of your choice. So follow each step to get the exact flavor and taste. Dry roast all the ingredients in batches(written under biryani masala) over medium flame until you get a nice aroma and transfer to a plate to cool down. Once they cool down grind them into a smooth powder. In a large bowl beat hung curd, mix all ingredients except chicken to make a smooth paste. Add chicken to the mixture. Mix well and keep aside for 4-5 hrs or at least 1 hr. Rinse the basmati rice well in the running water to get rid of all the starch. Then soak in water for 30 minutes. Mix the saffron and warm milk together in a bowl and keep aside. In between deep fry the thinly sliced onions until light brown. Place them on a kitchen towel to drain off excess oil. In the same oil fry the boiled eggs for 1 minute and set aside. Boil the potato halves for 5 minutes in sufficient water. Then set aside. Fry the potatoes by adding a pinch of turmeric powder until sightly golden. Boil sufficient water by adding all ingredients (written under rice preparation) together except rice. The water should be a bit salty. Once water starts boiling add soaked and drained basmati rice. Let it cook until the rice is half done. Drain the excess water and if you want you can discard whole spices and set aside. In the meanwhile, heat oil in a pan add sliced onions. Stir and cook until golden brown. Add the marinated chicken. Cover and cook until the chicken is 50% cooked. Now start assembling. Take a heavy bottom pan and grease oil. Put a layer of bay leaves. It will prevent charring and also sticking to the bottom. Spread a layer of chicken with some liquid and a few drops of kewra water. Spread a layer of half cooked rice. Top of the rice spread some barista and half a teaspoon of homemade biryani masala. Spread another layer of chicken with remaining liquid followed by a final layer of rice, topped with fried egg and potato. Spread some barista, saffron milk, few drops of kewra water, 1-2 drops metha attar, two tablespoons of melted ghee and half a teaspoon of biryani masala. For placing the biryani in dum, cover and seal the sides with a whole wheat dough. Now cook on a high flame for 5 minutes and 20 minutes over low flame. Once done turn off the flame and let it be there for 10 minutes. The Calcutta style chicken biryani is ready to serve. Serve hot. The biryani masala can be used as garam masala in curries/gravies. Keep it in an airtight container for longer use. The basmati rice for this biryani should be long grained and of good quality.